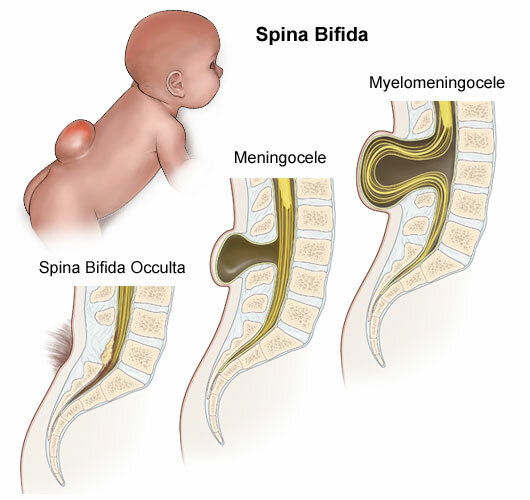 Spina Bifida (SB)1 is a congenital neural tube defect (Fig. 1) where part of the spinal column does not close completely. When this happens, the membranes covering the spinal cord or the membranes and the spinal cord are exposed. Sometimes the membrane and the cord protrude out the back of the spine. The extent of the damage depends on the location and degree of the exposure or opening of the spinal column. Difficulties can range from no obvious damage to paralysis and severe brain damage. 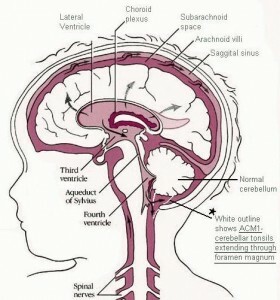 Hydrocephalus, or the buildup of CSF fluid (Fig. 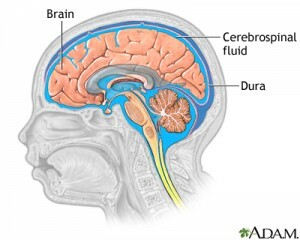 2) after a leak insidethe brain, often occurs with Spina Bifida. 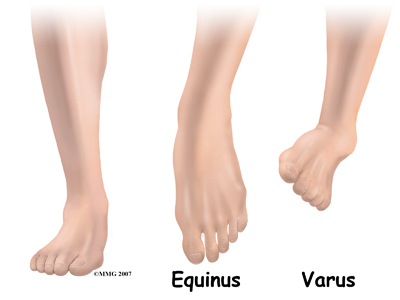 The exact cause is unknown, but it is thought that there are many contributing factors, including, for example, the presence of a tumor. Spina Bifida occulta – In this form, the vertebral arches are absent, but there is a hairy patch of skin over the defect. Meningenocele – In this form thereis a bulge in the lumbosacral area consisting of a meningeal sac protruding through the bone defect. 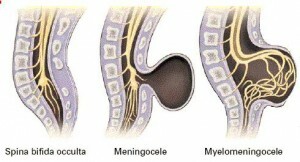 Myelomeningocele – In this form, the sac contains malformed spinal cord tissue. Encephalocele – This is a protrusion of brain through a defect of the skull, usually in the occipital area. Physiotherapy: Physiotherapist will help children develop their large muscles, use their legs, and learn how to use mobility equipment. IDP/AIDP: A child’s development may be monitored. SCD/ASCD: After age three, if the child attends a center based program, he or she may be referred to SCD/ASCD and their development may be monitored. Mental health: Most children with Spina Bifida do not have cognitive delays and are aware that they are different. They may have mental health issues and may need counseling or psychotherapy. Academic preparation: Children with Spina Bifida may need help learning how to maneuver their wheelchair or any walking equipment. 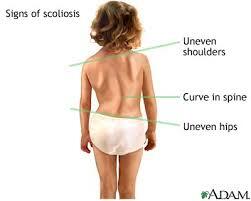 To learn about Spina Bifida in the middle childhood years, please visit the six to 12 part of this course.